Ed. note: InvestingHaven is the first in the world to offer a Blockchain Investing Research service, subscribe now to get the top 3 to 5 tokens per year and our proprietary risk/reward score for all blockchain stocks trading on public exchanges. The price of Bitcoin (BTC) and the price of Ethereum (ETH) has exploded in 2017. The question is whether there is sufficient upside potential to consider investing in cryptocurrencies. Stated differently, is it (still) worth looking into cryptocurrencies as an investment or is it too late? The key consideration is that Bitcoin is not the only cryptocurrency to invest in. On the other hand, Bitcoin has made cryptocurrencies popular and even more secure. Yes, there were definitely security issues a couple of years ago, but it seems those issues have been resolved. So Bitcoin has helped mature the cryptocurrencies space. InvestingHaven believes that a combination of price analysis and fundamental analysis is the most appropriate way to make a rational investment choice, and to engage in forecasting the price of cryptocurrencies. With that in mind, we also look into the altcoins space in this article in order to find investment opportunities. InvestingHaven’s research team has collected 10 investment tips for investing in cryptocurrencies which are useful to investors not very familiar in this space. Investing in cryptocurrencies is very similar to commodities investing. The fact of the matter is that commodities have two ‘faces’. On the one hand, they are assets that are used in the real world. Base metals, for instance, are used in industry. Softs are used in the food industry. 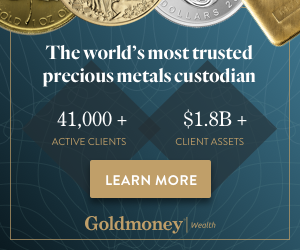 Precious metals are used in the jewelry industry. At the same time, commodities can be invested in, through open market exchanges. Cryptocurrencies are similar. They are used in financial and insurance applications, but investors can also invest in cryptocurrencies. From that perspective, it is mandatory to look at usage and added value that cryptocurrencies create in this world when choosing a specific cryptocurrency to invest in. All cryptocurrencies combined have a market cap of more than $60B meantime. So that includes all cryptocurrencies in existence: Bitcoin, Ethereum, Ripple (XRP), Litecoin, and hundreds of smaller and unknown ones. To put that into perspective, for investors, here are some reference points: Tesla’s market cap is $50B, Boeing Airlines $100B, Coca Cola $180B (rounded figures for April / May 2017). Note how the volume of real world transactions has gone up together with the market cap which indicates that ‘crypto is for real’. If it is important to look at real world usage as a key criterium when considering investing in cryptocurrencies, then there is great news for investors: “you ain’t seen nothing yet”. According to Statista, who has dedicated a section to cryptocurrencies useful for investing, we see that the number of adults in the U.S. familiar with the most known cryptocurrency (Bitcoin) is only 24 percent. 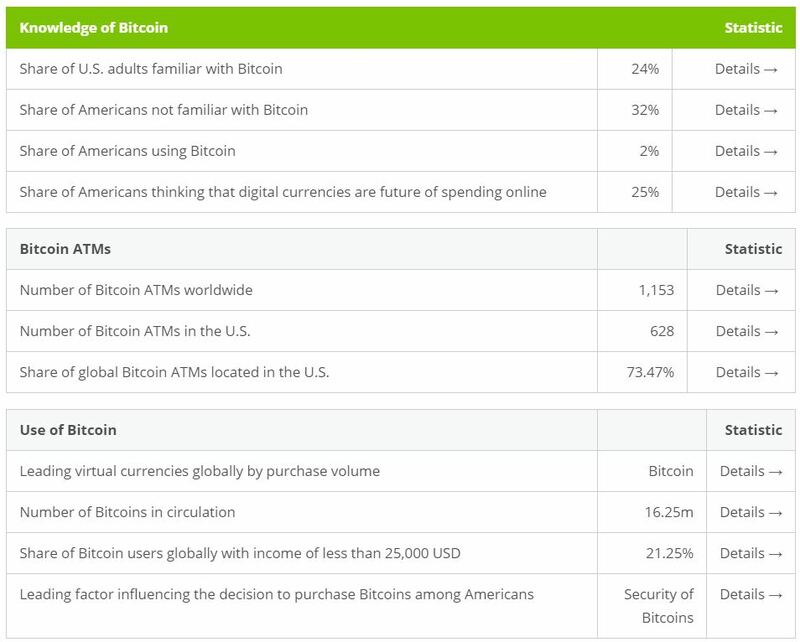 And, by far the most important data point on this graph, the number of Americans that use Bitcoin is 2 percent while the ones thinking of using it in the future is 25 percent. Investors should get excited when realizing this. Not primarily for Bitcoin, but more so for other cryptocurrencies. As said in the intro, analyzing fundamental data is the key element in our methodology to identify a decent investment opportunity. So supply and demand data, based on usage in the real world, is what investors should be focused on. That is also what we used as a method in our Bitcoin Price Forecast For 2017 and our Ethereum Price Forecast For 2017. Note that our Bitcoin forecast got filled meantime, as the price of Bitcoin went over $2000, a forecast we made more two months ago. As an example, when it comes to Ethereum, we have included the chart which features the number of its transactions, see below. This is proof that Ethereum is being used in the real world. Moreover, the number of Bitcoins in circulation is another proof of cryptocurrency usage, as well as trade volume. Note also how Ripple, a cryptocurrency which is meant to facilitate payments between financial institutions, and, in doing so, pushes transaction costs down meaningfully, has a great chart highlighting the strong usage of some large accounts along with the long tail of users: Ripple usage statistics. 5. Where are we in the market cycle? Given the above data points, we consider that we are nowhere near any point close to euphoria according to the traditional market cycle. It is maybe not very useful to consider Bitcoin as an investment opportunity, though prices can go much higher from here. However, there are many other cryptocurrencies which are only now starting to be considered by businesses, governments, and society across the globe. 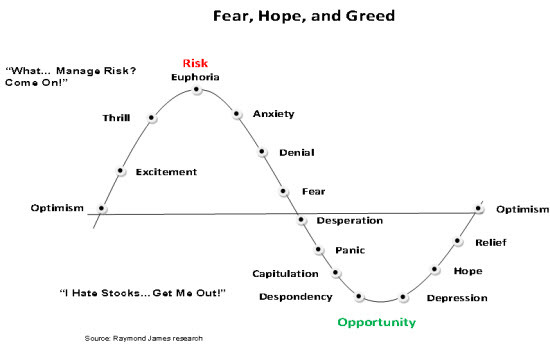 With that in mind, we believe we are only in the optimism stage in the market cycle. Note that this market cycle can be considered by individual cryptocurrency as well (we considered all cryptocurrencies combined when we stated that we are in the ‘optimism’ stage). Bitcoin certainly has gone through this cycle, reaching euphoria in January of 2014. Pareto is one of the few universal principles applicable in all areas of life, including in the investment world. We see a dotcom type hype arising and, presumably, 80% of cryptocurrencies will not survive the storm. We saw something similar in the dotcom hype. That is simply because, during a hype, users and investors do not focus sufficiently on the real added value that is created. It is imperative for investors, when choosing cryptocurrencies to invest in, that they acknowledge the added value that is created, from a business and society perspective. Just buying cryptocurrencies hoping that they will deliver an investment return does not make sense at all. The sweet spot for every investor is the ability to solve a problem: the bigger the problem that gets solved, the higher the potential value. One of the sweet spots that cryptocurrencies can enable as a problem solver is to provide access to money and basic banking functions like wiring and paying. A fact that is unknown is that a huge amount of people globally do NOT have access to to these traditional banking services. We consider that Stellar Lumens, symbol XLM, is such an enabler. At the moment of writing, Stellar Lumens trades at $0.05. Read on Fortune.com why Stellar has a disruptive potential, especially in the underdeveloped part of the world, and is worth a cryptocurrency investment. As with any other investment, investors should create their own portfolio and work on it actively. Also, they should work on it for the very long term. Creating a portfolio with some cryptocurrencies is the way to go. Choosing them selectively is imperative. Only invest in things you understand and keep your emotions under control are principles that should always be applied, in every investment portfolio. Do not forget that your cryptocurrencies can be exchanged for ‘traditional money’. The market is in the process of enabling all exchanges: all traditional currencies will be exchangeable with all cryptocurrencies, sooner rather than later. So the lock-in risk which was present a while back will not be a risk going forward. Stated differently, your portfolio with cryptocurrencies is just another way to store cash, or exchange crypto for cash (money), over time as market conditions change. Last but not least, as it goes with every hype, ‘everyone and his uncle’ can become a guru during a hype. Be very sceptical when following people and selecting sources to read. The blogosphere has only a handful of bloggers who are worth following, say maximum 20 percent. On September 3d and 4th the price of cryptocurrencies fell sharply and lost some 20% in just 48 hours. Although this is meaningful it happened to all top 10 cryptocurrencies as explained in this article. It is no reason to worry (yet). Read all about it in our article. Update: the blockchain is attracting huge investment capital. InvestingHaven is the first in the world to launch a blockchain investing research service.